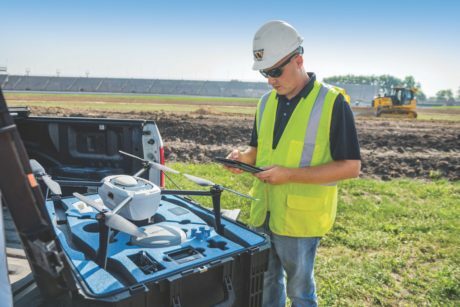 An excavating contractor feels the excitement of life at the racetrack - and works to redefine the course in a pretty big way - using John Deere machines and the Kespry Aerial Intelligence System. Petry Excavating, Inc. makes the grade with USAC Midget Racing, building a dirt track inside Turn 3 of the Indianapolis Motor Speedway. Having recently hit the company’s 25-year milestone, Petry is on the up and up when it comes to its usual projects including hotels, shopping centers, car dealerships, and the occasional racetrack. “We have 14 employees, and two of them are my sons. They both went to college and started as laborers here. Eventually, we were growing so fast, we had to change how we worked. I’m still involved every day, but they’ve really taken the load off me. Three primary parties have made the new dirt-track venture possible. The United States Auto Club (USAC), the world’s largest race-sanctioning body, has been the primary driver. Mason Adkins, grade control specialist for West Side Tractor Sales, demonstrates how simple it is to employ the Kespry Aerial Intelligence System on a jobsite. Getting the base information was just the start of the Kespry system and GPS technology advantage. Step One: The Kespry drone flies over the jobsite to quickly and precisely gather survey data. Step Two: Using that data, CAD files are created to illustrate what the site will become. Step Three: Those files are easily uploaded to GPS-enabled machines. Step Four: The computer does the rest! Simply drive the machine and the blade automatically adjusts as needed. As for Petry, the return on investment with SmartGrade is what sealed the deal. West Side Tractor Sales flies the Kespry Aerial Intelligence System to support the creation of the USAC Midget Racing track at Indianapolis Motor Speedway.